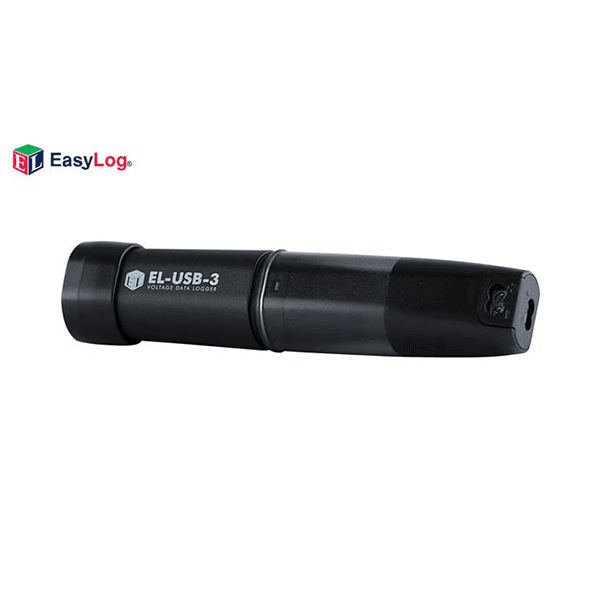 The Lascar EL-USB-3 USB Voltage Data Logger is a standalone data logger that measures more than 32,000 readings over a 0 to 30V d.c. range at a resolution of 5mV d.c. The data logger is supplied with a 0 to 30V d.c. cap featuring a pair of screw terminals and measurement leads terminating in crocodile clips. Easily set up the logger and view downloaded data by plugging the unit into a PC’s USB port and using the free EasyLog software provided. Data can then be graphed, printed and exported to other applications for detailed analysis. Supplied with ½ AA battery and wall mount clip. 0-30V d.c. measurement range 0 30 V d.c.
Internal resolution 50 mV d.c.
* depending on ambient temperature, logging rate and use of alarm LED.